- a new initiative to provide free skills training both online and in person to help people make the most of the web. We launched Grow with Google today at an event in Fairfield with Chris Bowen, the Shadow Treasurer, Shadow Minister for Small Business and Federal Member for McMahon. More than 500 people attended training sessions over two days at the Fairfield RSL in Western Sydney, which included workshops for business to learn how to be found on Google and use analytics, training for job seekers and students, and digital training for not-for-profit organisations. 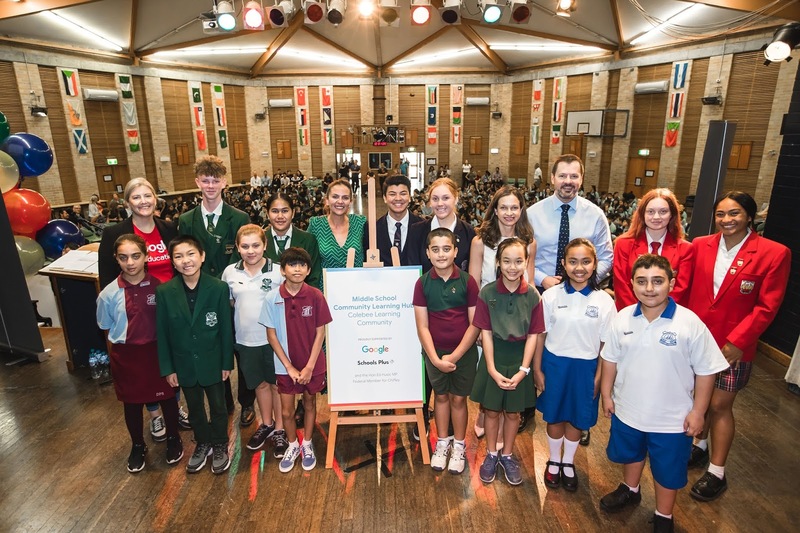 Grow with Google aims to help all Australians get the skills they need, whether you’re a student, a job-seeker or a business wanting to get online. We’re excited to expand our skills offering to more people, building on our existing digital skills programs. 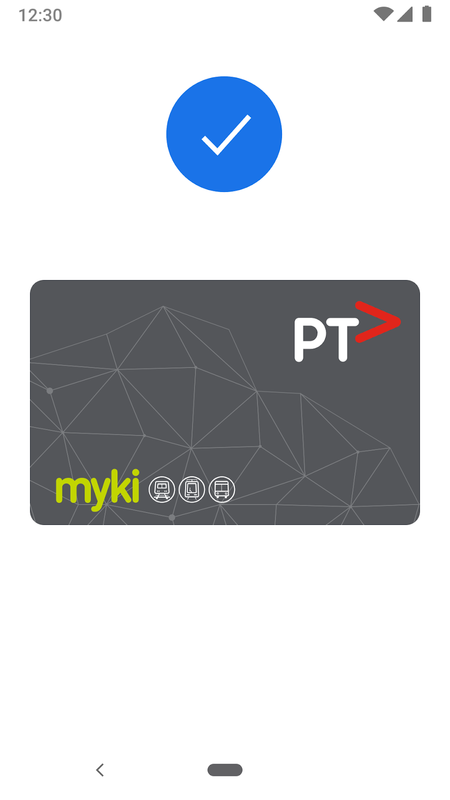 For Australians at all points on the digital journey, there are significant benefits to getting online - whether it’s finding new employment opportunities or expanding the reach of your business. If you want to grow your skills, careers, and businesses check out the free tools, training, and events at: g.co/GrowAustralia. 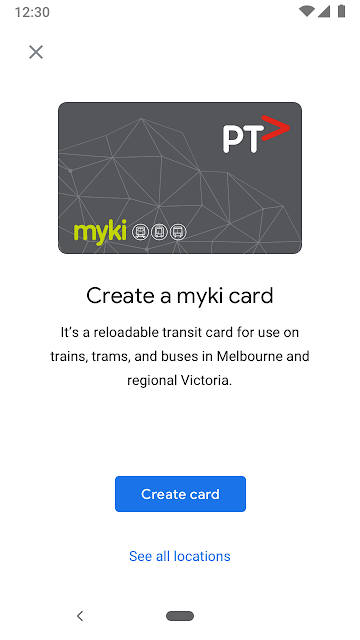 It’s no secret that digital technology is a part of everyday life for Australians - whether you are checking the bus timetable on your phone or building an online business - digital skills are essential. While the digital opportunities for Australian businesses and individuals are huge, we know that some people do not feel they have the skills they need to make the most of this opportunity. Australians want the chance to learn new skills - that’s why we’re launching Grow with Google - a new initiative to provide free skills training both online and in person to help people make the most of the web. You can now see a dashboard which gives you a complete picture of how you’re spending time on your device, including how many times you’ve unlocked your phone, and how many notifications you’ve received. 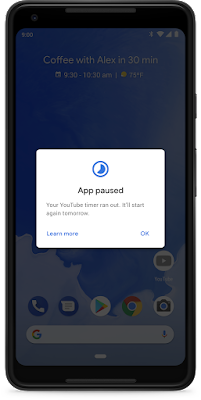 The App Timer feature lets you limit the amount of time you spend using your favourite apps so you can set time limits on apps, like “30 minutes for Gmail.” When you’re close to the limit you set for yourself on the app timer, you’ll get a nudge reminding you, and when time is up it will actually grey out the app icon to prevent further use. 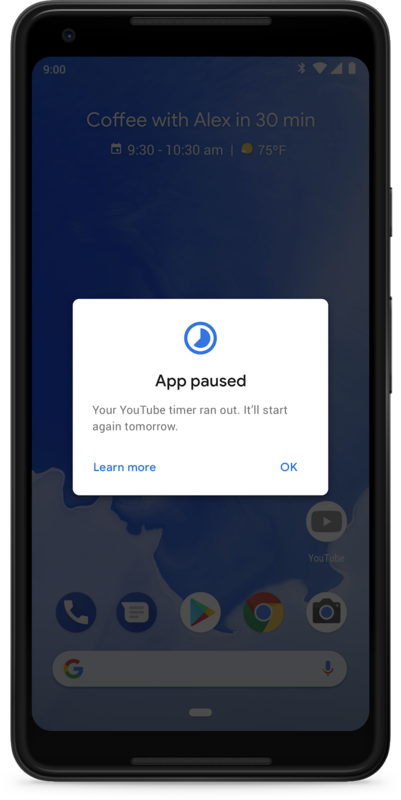 You can also activate the Wind Down feature so that at night, as you get close to bedtime, your device goes into Do Not Disturb mode and your screen fades to grayscale to help you disconnect. 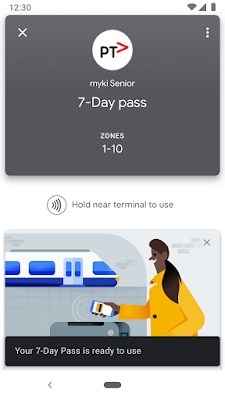 And with the Family Link app, parents can set boundaries and manage their kids on Android devices. 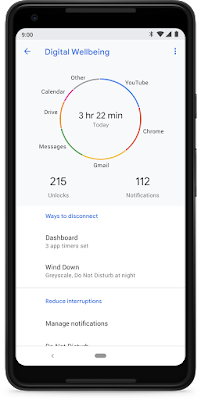 Family Link lets parents set screen time limits, approve or block certain apps, remote lock devices, and view activity reports so they can stay in the loop on how their kids are exploring. You can also transform your home into a workout or yoga studio in the morning. Say “Hey Google, show me how to do yoga on YouTube” to get guided through your practice with Hub or your TV. Video content has an enormous capacity to help us learn, visualise, memorise and validate information - packed full of actionable information. It also has the ability to inspire us, offering an aspirational future state to work towards. Keeping this in mind, we can then understand how videos can help us instil healthy behaviours into our lives, because at its core, habit formation is governed by three things - the trigger, the habit itself and the reward. What we’re seeing in wellbeing content on YouTube is a type of interaction that’s more involved and rooted in the lived experience of the audience - participatory consumption. In the wellbeing space, Aussies are tuning into YouTube to induce an action in the real world. Pressing play and starting the video is a trigger for healthy behaviour. Check out this video by Jason Stephenson, which is currently the most watched guided meditation piece of content on YouTube by Australian audiences. To easily find more wellbeing content on YouTube, we’ve teamed up with nonprofit organisations - like Hello Sunday Morning and Project Rockit - to provide viewers with video playlists that explore a variety of health and wellness topics. We know that wellbeing means different things to everyone. We all have different goals – whether you’re trying to break a world record or need help with everyday tasks. Around the world, we are working to discover new applications of technology to help people with disabilities. People with vision impairments can now learn more about around their surroundings and enjoy VR. And those with restricted mobility – such as 19-year-old Robbie Ivey from Michigan – are exploring new ways to manage their routines and conditions through voice-enabled technology. 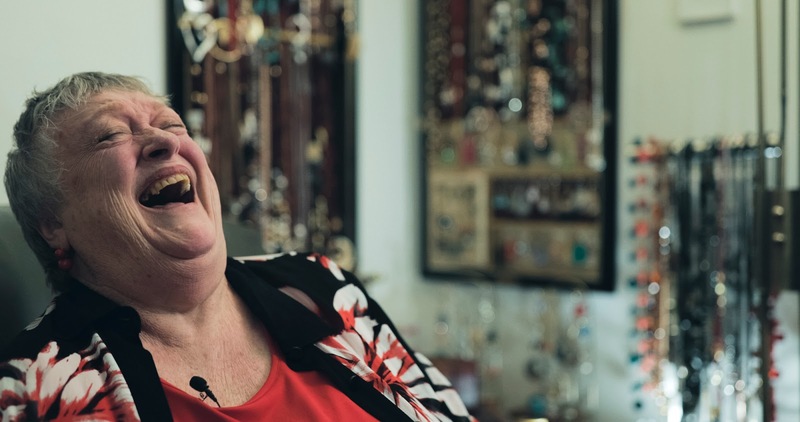 On a local level, Gold Coast based non-profit Feros Care is breaking new ground in Australia by developing new applications to help seniors and people living with a disability with their everyday care. Feros Care has been delivering services to seniors for thirty years, and smart home services over the past ten years. These services include in-home care, residential aged care, veteran’s services and getting seniors back on their feet after a hospital stay. After building MyFeros, a self-service tool allowing seniors to manage their care via desktop, mobile or tablet, Feros Care’s CIO Glenn Payne realised his team could do more to bring this experience to seniors experiencing a loss of vision, mobility and dexterity. 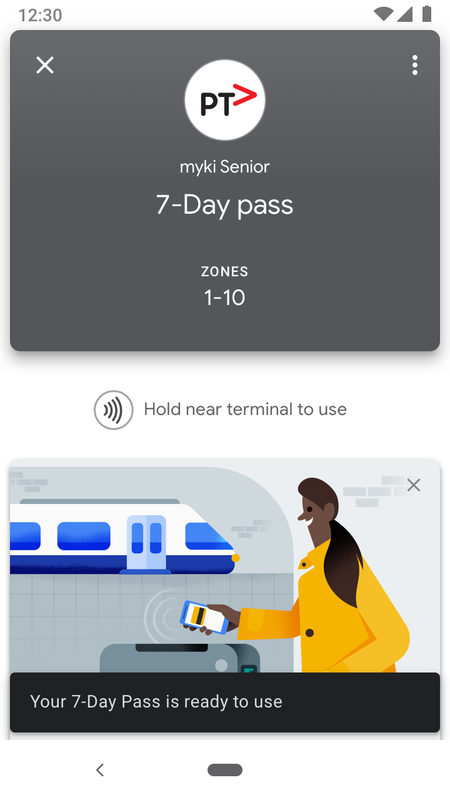 With a new Google Assistant Action, seniors can now check and manage a range of services via voice command – without having to move to the computer, read screens or type on a keyboard. Leaning on Feros’ broader expertise and services, seniors can also schedule smart home consultations to automate devices that integrate with the Google Assistant, to help them with tasks that would otherwise be a challenge to control manually. Since Google launched Search in 1998, we’ve always aimed to build products that help you get things done efficiently and free you up to focus on the other things that matter to you – whether you are looking for inspiration or help around the home. That’s more important now than ever, and we’ll keep building with that principle in mind. The world we live in today is very different from the one we lived in when Google started back in 1998. We’re no longer reliant on computers to perform simple searches and send basic email. With the phones in our pockets and a range of smart Home devices, we can accomplish things we couldn’t have dreamed of on desktop. As technology becomes increasingly woven into our day-to-day, making sure it’s adding to your life – instead of distracting from it – is more important than ever. Technology is by no means the solution to total wellbeing, but it can be a powerful tool to inspire and manage healthy habits – whether you’re reclaiming time, working out, cooking up a storm, or getting things done efficiently around the home. event in Melbourne today to celebrate International Women's Day 2019. Partnering with Business Chicks, the Digital Garage workshop championed female entrepreneurs and provided guests with the chance to learn new skills. Federal Member for Chisholm, Julia Banks MP opened the event and spoke about the importance of supporting women in business. "I think what Google is providing here today can only be a positive thing in terms of growing and developing your businesses. Growth is about embracing change, and I want nothing more than to see more and more successful women-led businesses in this country,” Ms Banks said. We also heard from Nellie Kerrison, owner of Relish Mama; Jill Tucker, owner of Erilan and Lucinda Hartley, co-founder and CIO of Neighbourlytics who shared their inspiring stories of building a business online and spoke about how digital marketing can help. The training included an introduction to digital marketing and tools to help businesses be found online by new customers. We also held a Women in STEM Breakfast, co-hosted with Science and Technology Australia (STA), featuring Victoria’s Lead Scientist, Dr Amanda Caples who laid out her vision for the future of women in science, technology, engineering and maths. At the breakfast we announced a new partnership to support Superstars of STEM. This program, run by STA, aims to shift gender assumptions and empower leading female scientists, technologists, researchers and educators to become public role models. 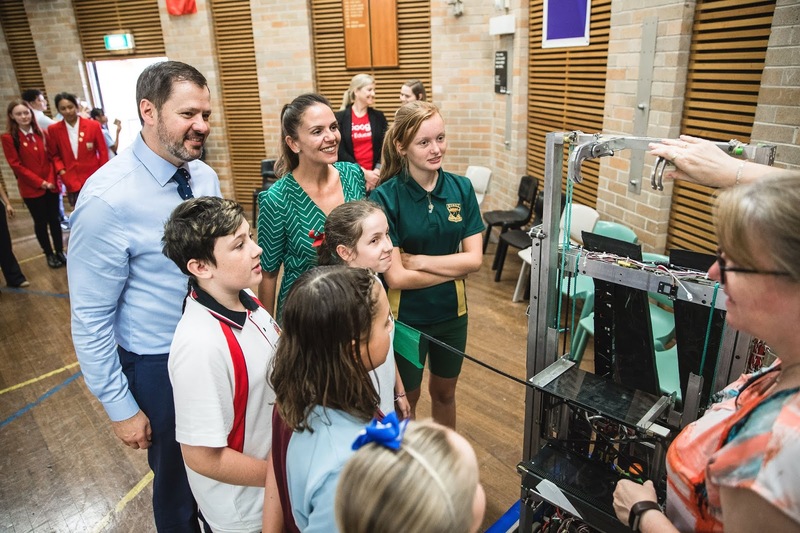 We will partner with STA to support program participants with mentoring, training and collaboration on education outreach with a goal of inspiring women and girls across Australia to engage in STEM education and careers. If you couldn’t make today’s events or you want to learn more, you can always check out the Digital Garage training online or find more events near you here. Wishing everyone a great International Women’s Day as we work to #BalanceforBetter! Almost 100 female business owners and operators came together for a Digital Garage event in Melbourne today to celebrate International Women's Day 2019. 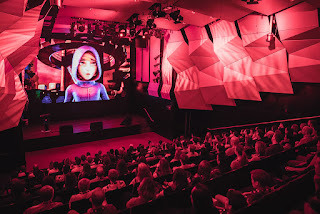 Last night in Sydney we hosted the world premiere of the latest YouTube Originals series, SHERWOOD - a 10 part animated series set in the dystopian future of 2270. It’s based on the mythology of Robin Hood and follows 14 year-old Robin and her friends’ as they battle with the wealthy Upper City in their efforts to overcome inequality and fight for justice. 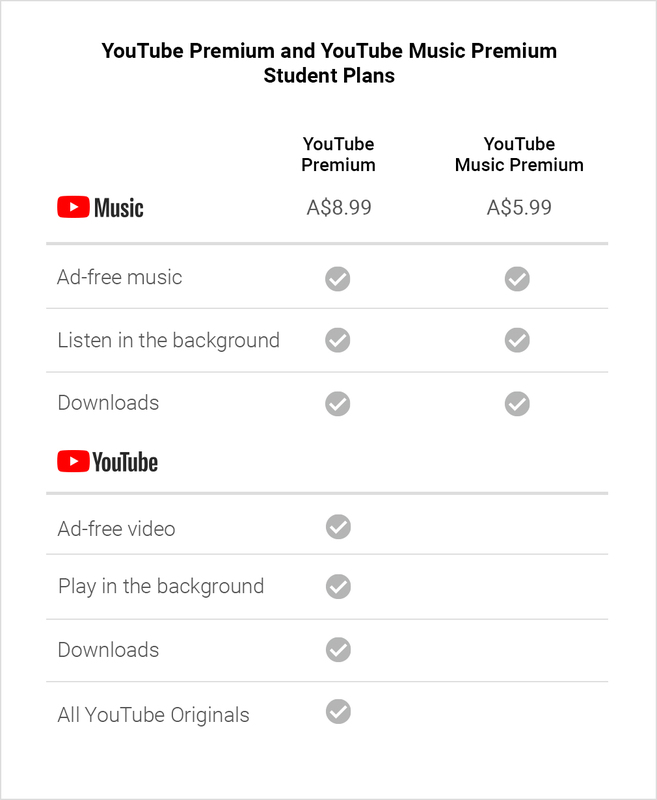 You can watch it now too, on YouTube Premium. It is a truly global production, created by an ensemble of talented cast and crew from far flung parts of the world. Produced by Baby Octopus (Australia/US), Toybox (New Zealand) and Giant (Ireland) - Diana Manson and Megan Laughton serve as executive producers, Jan Stebbins and Nanette Miles as producers, Bruce Carter is the director and Jonathan Clarke the animation producer - while head writer Justin Trefgarne worked with writers Craig Martin and Shea Fontana to shift the legend of Robin Hood into the future and bring it to life for a new generation. 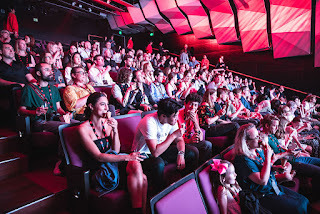 The all-star voice cast also transcends countries, featuring Anya Chalotra (The Witcher, The ABC Murders, Much Ado About Nothing), Tyler Posey (Teen Wolf, Truth Or Dare), Aneurin Barnard (The Goldfinch, Radioactive, Dunkirk), Jamie Chung (The Gifted, Big Hero, Gotham), Neneh Conteh, Rachel House (Whalerider, Thor, Moana), Ade M'Cormack (Lost, Heroes, NCIS), and Darrill Rosen (The Misogynists, Richard’s Wedding, First Person Singular) with guest star Joseph Fiennes (The Handmaid’s Tale, Elizabeth, Shakespeare In Love). 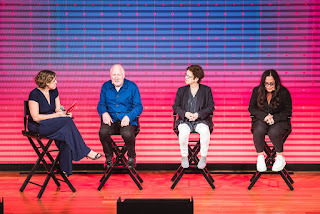 To help imagine this future world and what it meant for design, travel, technology and society, we convened an advisory council with Google’s Computer Science in Media team as well as thought leaders from organisations across Google. This collaboration and their insights helped shape SHERWOOD and let us test theories and ideas - like what a key in 2270 might look like… biological, of course. Beyond the brilliant team behind this stunning animation, it’s a thrill to finally share this series (which has been four years in the making! ), as it addresses some topics close to my heart. 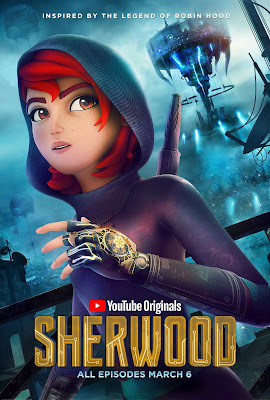 In this modern telling of Robin Hood, Robin is a girl who uses technology and code to battle the sheriff of SHERWOOD. We hope it can inspire people - young women in particular - to be excited by code and technology and the ways in which it can play a part in their own lives. We’ve seen this before - a Thicket Labs research report on young girls who watched season one of the YouTube Originals series Hyperlinked, revealed that they were 11 percent more likely to consider a career in Computer Science after watching the series. 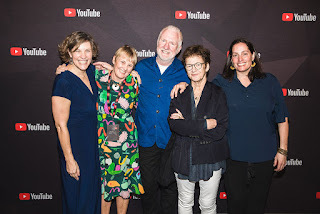 This week the work YouTube is doing to inspire the next generation of STEM innovators was acknowledged at the IF/THEN Conference where both Hyperlinked and SHERWOOD were showcased as examples of positive portrayals of women and girls in Computer Science and Technology. As Geena Davis says ‘If she can see it, she can be it’ and with Robin I believe we are giving girls all over the world a leader who they would want to be. I am excited for my 12 year old daughter to binge the series this weekend! SHERWOOD is available on YouTube Premium now. Check out the trailer or watch the first episode. is a huge event and this year was no exception, with more than 500,000 people from all over Australia and across the world coming together to celebrate. We were delighted to support Mardi Gras through the Community Grants Program, our new initiatives for LGBTI+ businesses and Fair Day. Through the Mardi Gras Community Grants Program we provide funding to individuals, community groups and not-for-profits, allowing these organisations to deliver their messages loudly and proudly during the 2019 Sydney Gay and Lesbian Mardi Gras Parade. Bi+ Visibility: a partnership between Bi+ orgs, aimed to build community, fight bi-phobia and bi-erasure and address mental health issues. Diversity Launceston: a community-run, not-for-profit organisation for LGBTIQA people in Launceston, providing opportunities to meet and form connections. NSW Trans Youth Alliance: nearly 200 young trans people and allies, this float is themed Trans and Proud – Trans is Beautiful, as a marker of their courage to come out and be themselves and to march without fear. The Institute of Many: an independent, grassroots, movement for people living with HIV. Women in AFL: to Women in AFL, their sport is not about gender, sexuality or differences – it’s about inclusion, the collective and teamwork. We also hosted a Digital Garage for Mardi Gras 2019 skills training event at the Google office in Sydney last week for LGBTQI+ individuals and allies who own or manage a SMB and wanted to learn new skills to help their business be found online. Partnering with the Sydney Gay and Lesbian Business Association, participants learnt how to get started with digital marketing tools, including our free online skills training platform The Digital Garage. We also launched a new LGBTQ-friendly attribute on Google My Business - one way that business owners can let customers know they're welcome. In our dedicated area at Fair Day, we provided a fun and safe space for fair-goers, showcasing the work of incredible local artist Luke John Matthew Arnold with the “Fearless Selfie Stand”. Our stall was a celebration of his work, fearlessness and an invitation to all fair-goers to take a great selfie and support the LGBTIQ+ community while having a good time. We’re proud to celebrate Mardi Gras and help more individuals and communities have the chance to shine. Counting down for next year! Sydney’s Gay and Lesbian Mardi Gras is a huge event and this year was no exception, with more than 500,000 people from all over Australia and across the world coming together to celebrate. Global sensation and multi-instrumentalist Tash Sultana reveals ‘The Story So Far’, a new three-part documentary series following the 23 year-old’s rise to fame. Starting a YouTube channel back in 2011, Tash’s videos have generated over 100 million views - with the ‘bedroom recordings’, including Jungle and Higher, now infamous. It’s from these videos and busking on the streets of Melbourne that this one-person musical powerhouse is now commanding the world’s attention - being nominated for (and winning) ARIA Awards, record-breaking sold out shows at major theatres and arenas globally and playing at the world’s biggest festivals as people line up to hear the unique style and magical vocals of this self-taught artist. The new series, ‘Tash Sultana - The Story So Far’, includes stories from and interviews with Tash as well as those who have witnessed the journey, including Regan Lethbridge and David Morgan from Lemon Tree Music, Jaddan Comerford from UNIFED, Paul Harris from Sony Music, Gang of Youths lead singer, David Le’aupepe, Alison Donald from Kobalt UK, Michael Goldstone and Suzanna Slavin from Mom+Pop Music, and Pierce Brothers. Check out the first episode now on Tash’s channel, with episodes two and three to follow. 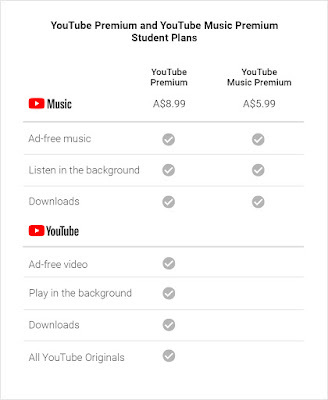 Posted by Ruuben van den Heuvel, Head of Music Content Partnerships (South East Asia, AU/NZ), YouTube.